is not sales. It works WITH sales to help buyers manage their back-end decisions. helps buyers get the buy-in from all the right people so they can purchase. is a change management model that leads buyers, step by step, through all prepurchased activities. 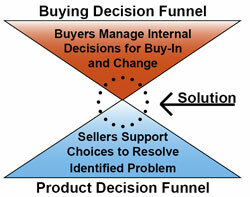 is a new skill to lead buyers through their decision issues. helps buyers recognize all decision makers who need to be on the Buyihg Decision Team. shows buyers how the new solution will touch the status quo, and help them manage the change. The length of the sales cycle is the time it takes buyers to get the necessary buy-in. Buyers only buy when they align all people and policies, manage all relationships, and get buy-in from management. Buying Facilitation® leads buyers through these activities and decision points so they can do whatever they must do to make sure a new purchase will not seriously effect their status quo. By navigating buyers through their behind-the-scene, pre-purchase decisions, our clients close sales in 1/8 the time. Add Buying Facilitation® to your sales (including your telemarketing outreach) and help manage the buying decision. And then you can sell. A lot more. Leads buyers to discover all Buying Decision Team members within 2 calls. Diminishes the sales cycle by at least 1/2. Thoroughly qualifies prospects on the first call. Manages internal relationship/politics issues that lay dormant in the buyer's environment. Gives sellers tools to be a true Trusted Advisor, Relationship Manager & Servant Leader. Closes 40% of qualified leads. Qualifies leads on first call and deletes non-buyers immediately.